The sci-fi comedy Men in Black turns 20 today. I’m a big fan of this movie. I love the irreverent banter, the cohesive chemistry between Will Smith and Tommy Lee Jones, the unique world that’s built up (“Casablanca…except no Nazis”), the “soft” sci-fi that drives the story along at a breakneck pace without ever getting in the way…it’s not a perfect movie, but it’s a lot of fun. Still, as fun as it is, it has a deep side to it, too. Most of it revolving around the concept of what we know. My heart loves this story because my heart lived this story. If you’re a Christian, you probably had this experience: one moment, you knew that God’s story had nothing to do with your own. You knew that you didn’t need a savior. Maybe you even knew that He didn’t exist at all. But then, with all the weight of a foregone conclusion, He spoke directly to your soul, replaced your heart, and left you a little bit shell-shocked. And then you knew something different. This is one scene that I’ve always been fascinated by: a man who’s never given any thought to beings beyond humanity, suddenly having his life changed radically by the revelation and invitation to a greater purpose he never new existed. It reminds me of me. My heart loves this story because my heart lived this story. But once you know the truth…then what? The Only Way to Get On With your Happy Life? Edwards, of course, says yes; and as K begins his training, the world around the MiB begins to fall apart with the death of an alien royal, the loss of a priceless object, and the murderous rampage of an oversized roach with a grudge. When J fires his weapon at the villain in a street full of people, thinking that the risks justified the danger of exposure, K is furious. There’s always an Arquillian Battle Cruiser, or a Corillian Death Ray, or an intergalactic plague that is about to wipe out all life on this miserable little planet, and the only way these people can get on with their happy lives is that they DO. NOT. KNOW ABOUT IT. K’s speech here, like his recruiting pitch to J, has always fascinated me. It took me a while to figure out why, but then I realized: my heart loves this story because I lived it, too. In fact, I fall into it all the time. The way I see it, the villain of my story likes to run around my mind disguised as an ordinary thought, or in a suit that makes me think that it’s just a “reasonable concern.” It drops the weight of my sin around me like an explosion, and suddenly the depth of God’s holiness and goodness doesn’t seem like the beautiful truth that it is any longer. Instead, it seems more like a threat. So I try to deny that beautiful truth that God showed me on the day He broke into my life. I try to ignore the reality that I’m walking with God in a bigger world. I try to forget and get on with my happy life by ensuring that I DO. NOT. KNOW ABOUT IT. 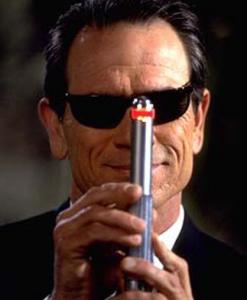 Of course, one of the most well-known parts of the Men in Black world is the standard-issue “neuralyzer” – the oversized chrome-plated pen that can flash memories right out of a person’s head. J uses the device on K at the end of the film, when the older man has decided that he doesn’t want the memories of evil aliens and other terrible things any longer. It illuminates his line from earlier in the film – the “happy lives” he’s talking about those who are ignorant of aliens? He’s jealous. He wants to go back. He wants to forget. But what he really needs is to remember better. That’s the same with you, too; you don’t need to forget God. You don’t need to have the memories of your terrible sin removed from your brain. You need to remember better. You need to remember that Christ died for you while you were still a sinner. You need to remember that you were an alien, but that God has made you a son. It’s not made-up, it’s the Most True Thing: God sent His son to save sinners, and His power was great enough…to do it. Thanks for reading! If God has blessed you through Redeeming Culture, we’d love to hear about it. Please let us know in the comments or on social media. This entry was posted in Sci-Fi and tagged memory, Men in Black, MiB. Bookmark the permalink.